You own a bicycle? Great! You have a sense of adventure? Better yet. 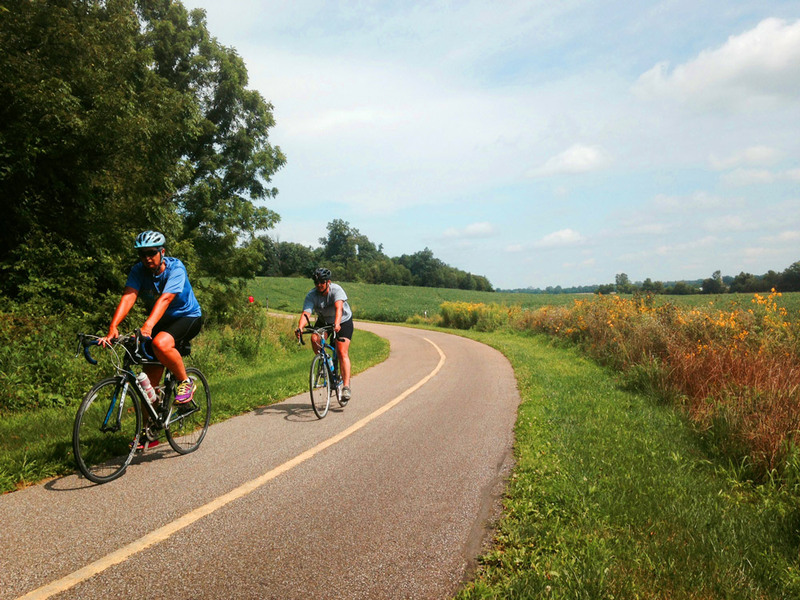 Goshen-area bike trails await you, dear reader. 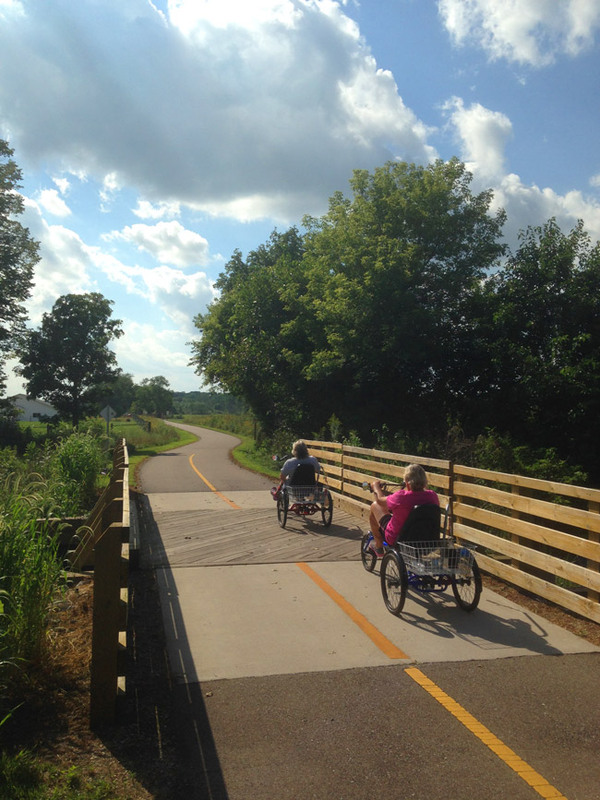 A network of paths – the Pumpkinvine Nature Trail, Maple City Greenway, and MapleHeart Trail – link Goshen, Middlebury, Shipshewana, and Elkhart. In addition to cycling, they are also suitable for jogging, running, and roller-blading. 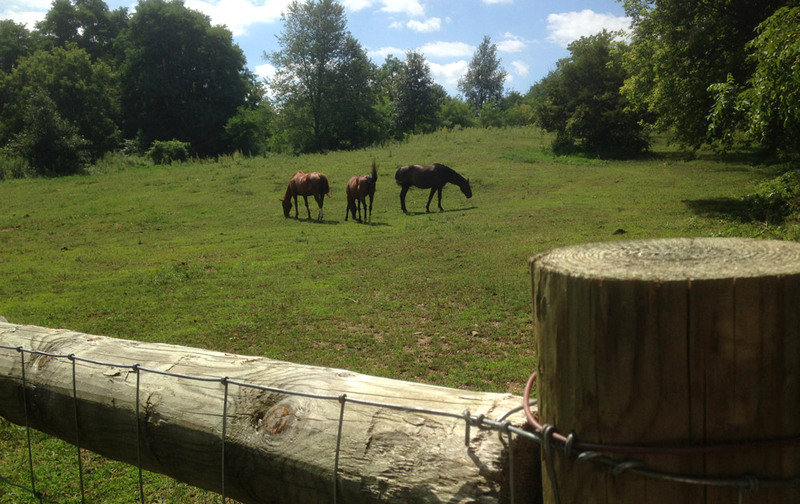 Exercise and recreational opportunities abound, and the views from the trails are stunning. Let us help. We took to the trails ourselves, armed with a camera and a pair of wheels, to give you a preview of what the trails have to offer. 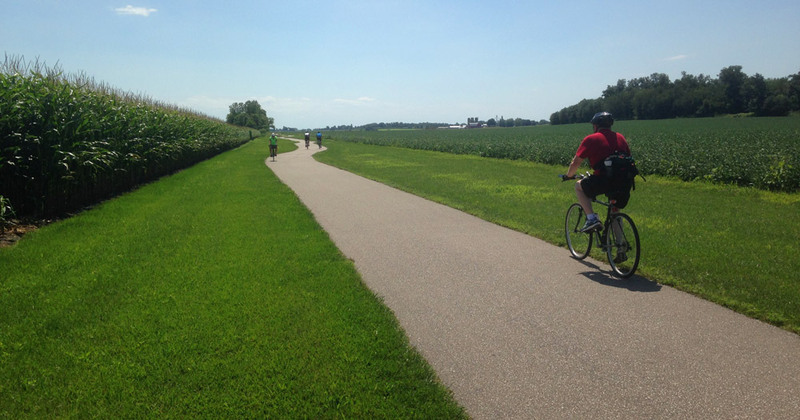 Our route included a portion of the Maple City Greenway in Goshen and headed northeast to Shipshewana, as well as other legs of the path network. Once you get started, we think you’ll enjoy exploring them all. See you on the trails! 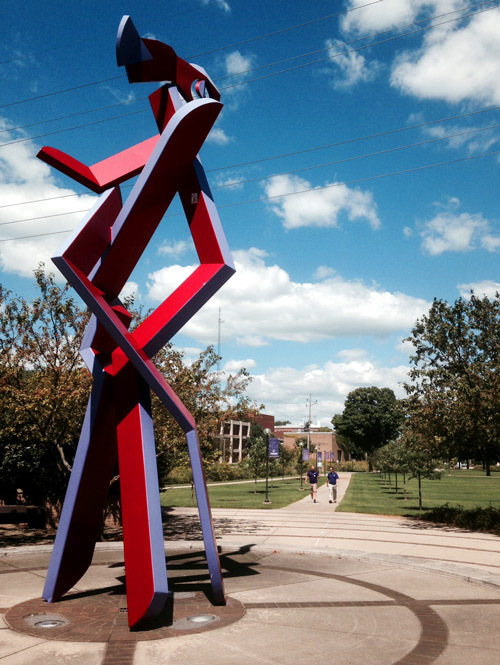 Part of the Maple City Greenway runs through the Goshen College campus. We decided to start our journey there. This picture was taken outside the Recreation-Fitness Center. The Greenway runs past the Goshen Dam Pond. Fish dwell beneath the pond’s placid surface. 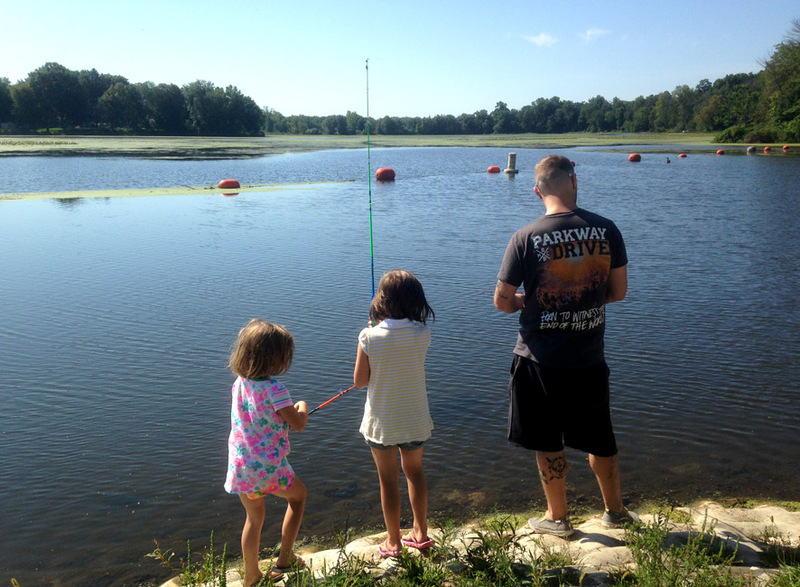 Fishing enthusiasts can be found on dry land. The Greenway includes a tunnel under Plymouth Avenue. 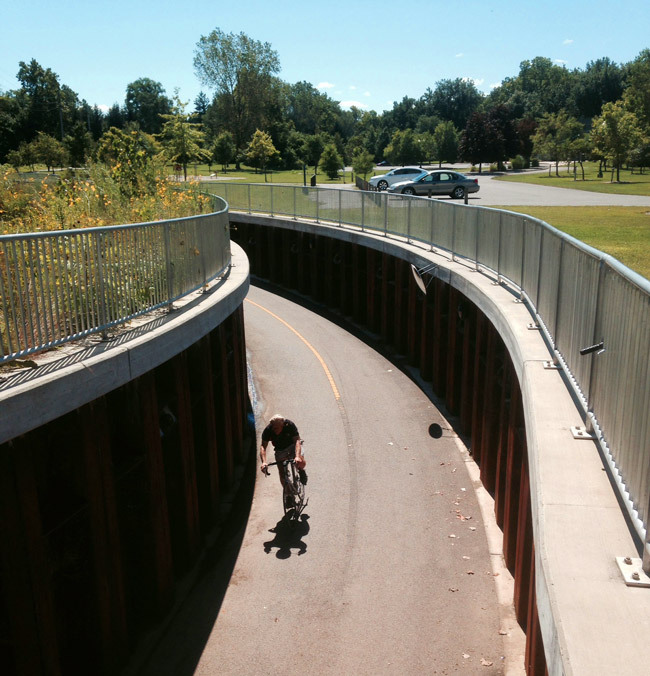 Thanks to the tunnel, cyclists can maintain their speed and not collide with automobiles. 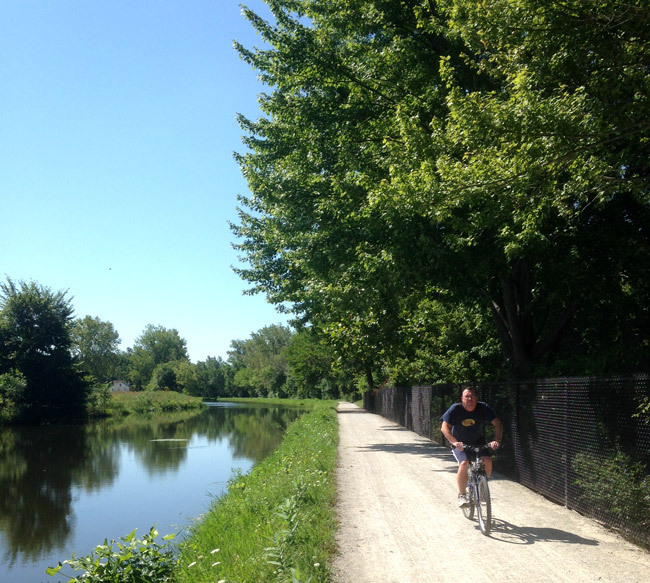 A stretch of Maple City Greenway runs along Goshen’s millrace. … And now the 3-mile mark. Cycling can be enjoyed as a solitary pursuit or, as this photo indicates, as a group project. Is it, perhaps, a view of the countryside in rural Middlebury? Let the Pumpkinvine Nature Trail help. 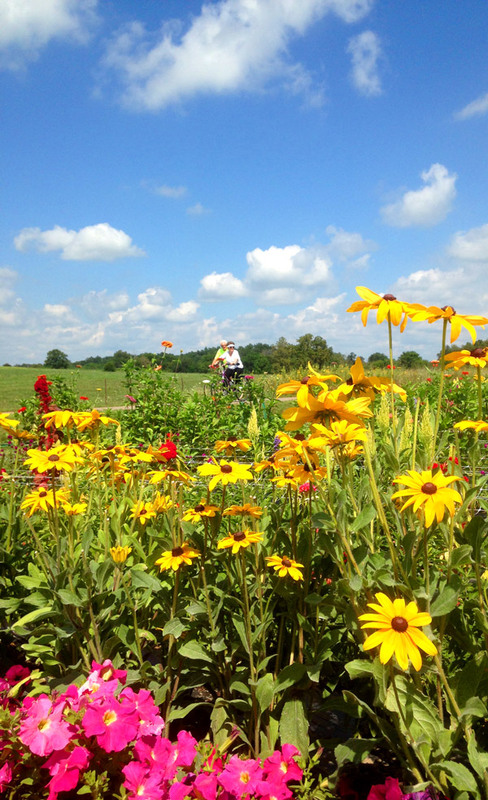 There’s a feeling you’ll get, when you look to the west … and see Krider World’s Fair Garden in Middlebury. The garden, located at Pumpkinvine mile marker 10, is a replica of an exhibit at the 1933-34 Chicago World’s Fair. 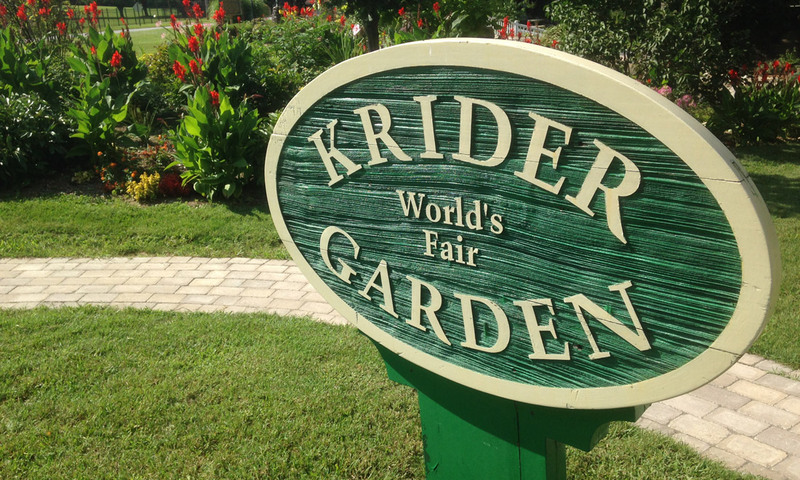 Krider Nurseries was founded in 1896 by Vernon Krider, and produced its first catalog in 1906. It was primarily a wholesale business, and also served the mail-order market. It ended operations in 1990. 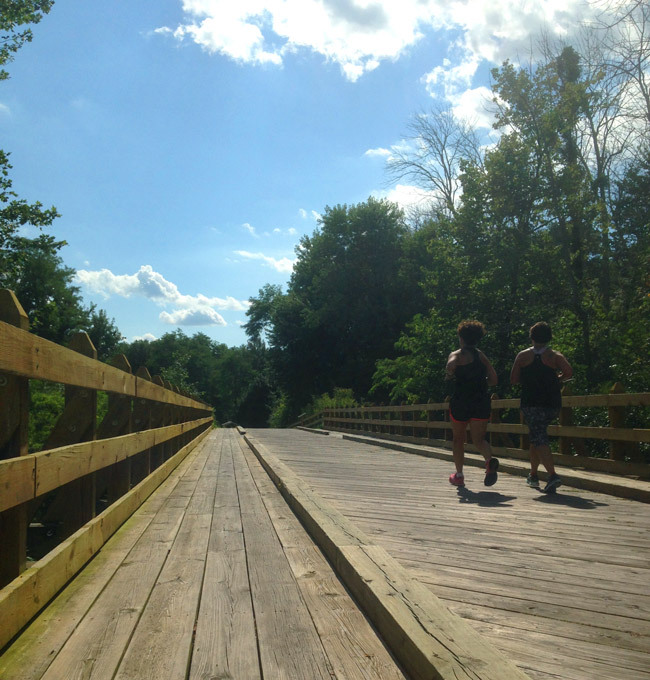 Just north of the Krider garden, the path crosses the Little Elkhart River via a 160-foot wooden trestle bridge. 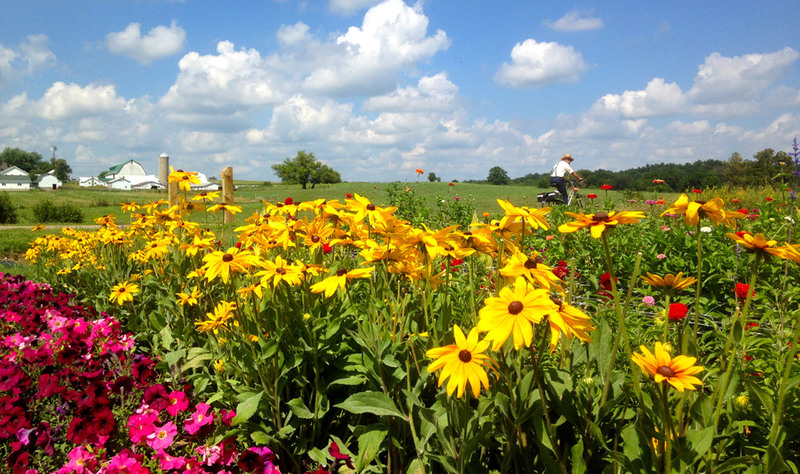 Speaking of gardens, a lovely flower patch sits along C.R. 43 in Elkhart County. Now we’re traveling east, just past C.R. 1150 West in LaGrange County. Onward, toward Shipshewana, heads the trail. 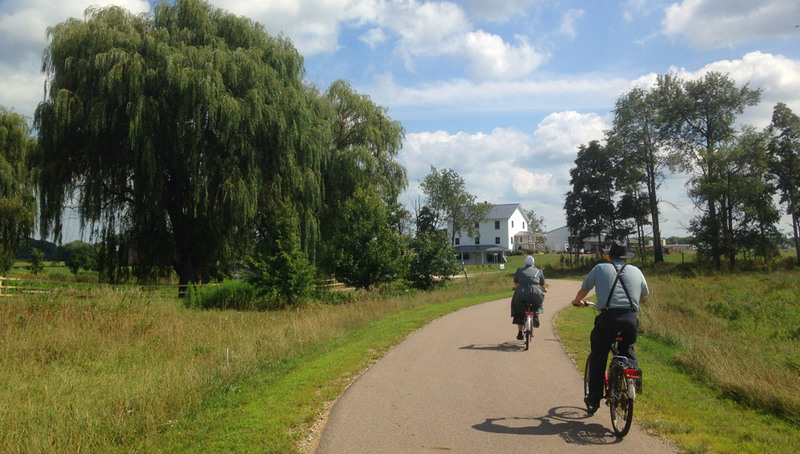 And back again, toward Middlebury and Goshen. These fine folks are headed west, approaching C.R. 43. The Pumpkinvine is an abandoned railroad corridor extending from Goshen to Shipshewana. 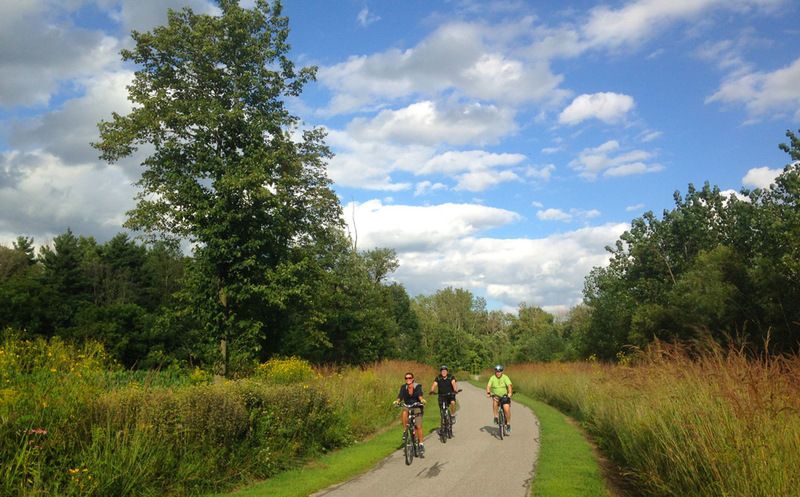 The organization Friends of the Pumpkinvine Nature Trail Inc. bought the corridor from Penn Central in 1993 with the goal of developing a linear park network. As disputes regarding land ownership were settled and building funds were available, the Friends transferred corridor property to local parks departments for path construction and management. 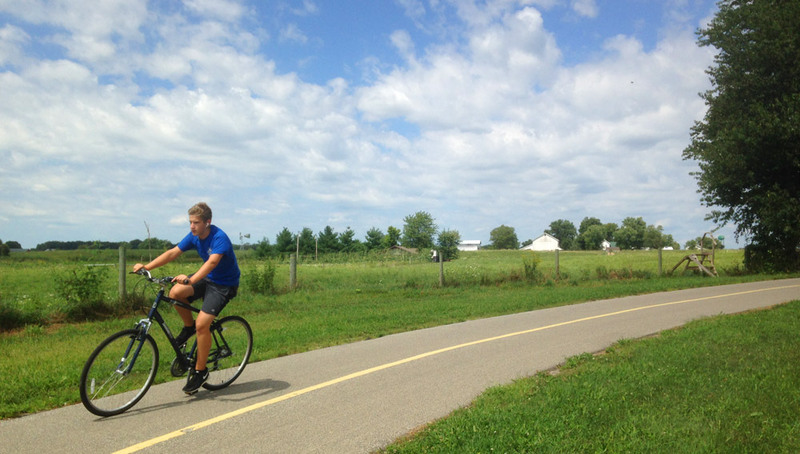 The Pumpkinvine Nature Trail is a 16.5-mile path between Goshen, Middlebury and Shipshewana. 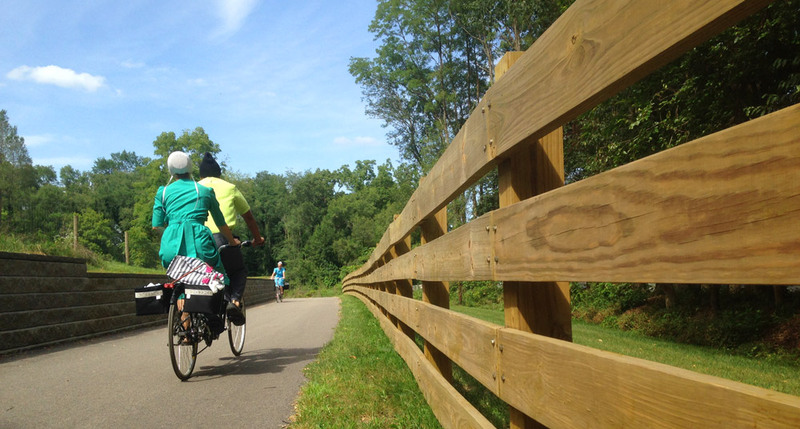 The Maple City Greenway consists of 25 miles of urban trails connecting the schools, businesses and neighborhoods of Goshen. MapleHeart Trail runs parallel to C.R. 45 (Wilden Avenue in Goshen) between the Goshen city limits and Hively Avenue in Elkhart, a distance of roughly 5 miles.